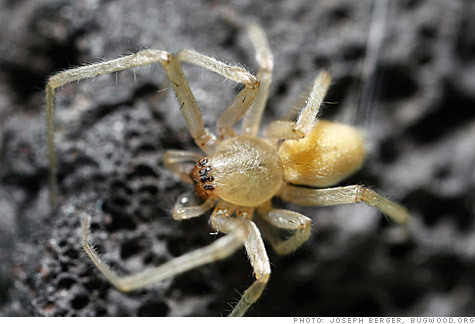 NEW YORK (CNNMoney) -- Mazda is recalling about 52,000 Mazda6 sedans in the U.S., because yellow sac spiders like to build their nests in part of the fuel system. "A certain type of spider may weave a web in the evaporative canister vent line and this may cause a restriction of the line," Mazda said in a letter to the National Highway Traffic Safety Administration. The evaporative canister vent line runs from a charcoal-filled canister that cleans air coming out of the gas tank. Blockage of the line can prevent air from getting into the gas tank as the gasoline is used, resulting in negative air pressure inside the tank. That can lead to a crack in the gas tank and the possibility of a fire. There have been 20 reported cases of spider infestation in the Mazda6 -- all have been in cars with 4-cylinder engines, none with V6's. No actual fires are known to have been caused by the spiders, according to Mazda's letter. 0:00 /2:21Ford Fiesta rolls into U.S. Dealers will inspect and, if necessary, repair the fuel system in the cars. A spring will also be installed to prevent spider intrusion, according to the letter. Letters will be mailed to owners of affected vehicles beginning at the end of this month. It's unclear why this particular spider -- the yellow sac spider -- seems to prefer the model year 2009 and 2010 Mazda6, company spokesman Jeremy Barnes said. All modern cars have the same type of equipment. "Maybe they just like cars that go 'Zoom-Zoom'," he said. "We honestly don't know."